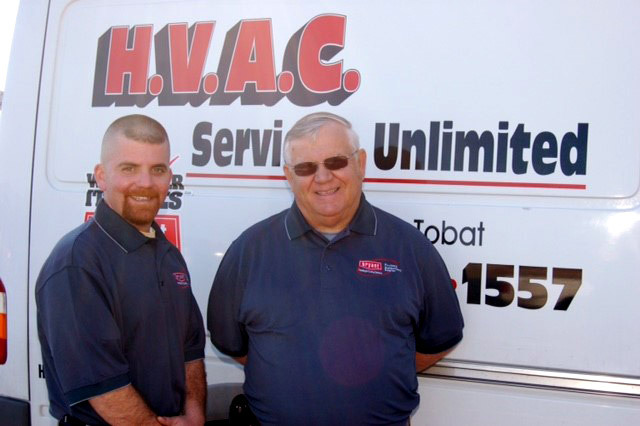 HVAC Services Unlimited was created July 1st 1982 as a family owned and operated business. Frank Tobat and his wife Linda continue to operate their business as a family operation. Their son "Pat" now is Vice President and Service Manager. Frank has extensive experience in all phases of heating including Hot Water systems, Steam systems, Boilers, Furnaces, Heat Pumps, Air Conditioning and Geothermal. His background includes the U.S. Coast Guard and 10 years with the largest Plumbing HVAC Distributor on the Shore. "Pat" provides most of the service and maintenance today. Whether it is routine service or a complicated installation of a multizone heat pump system or a steam boiler HVAC Services can provide it. The installation crew lead by A.C. Scott is very experienced at installing HVAC systems in regular homes and the most sophisticated homes on Delmarva. All installation and service personal are licensed by the State of Maryland. HVAC Services also holds a Delaware HVAC license.